By Amy Hall. Many thanks to Eliza Egret, Lydia Noon and Tom Anderson for their help with the interview. This is part of a series of interviews with Palestinians from Area C who have experienced demolitions of their homes or property carried out by the Israeli occupation authorities. In our interviews we will show some of the effects of demolitions, and highlight the companies involved in carrying them out. Some of Rezeq Abu Nasser’s most vivid memories are of Wadi Qana – the lush valley next door to his home village of Deir Istiya. Here was where he first learned to swim without help, where he and his brother almost got struck by lightning in a freak storm during an olive harvest. 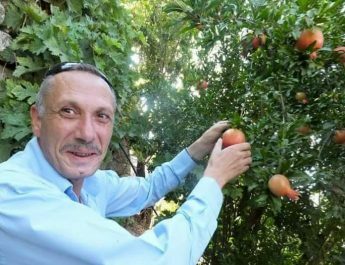 Rezeq spent over two years in the Wadi in the late 1980s, hiding from the Israeli authorities, one day narrowly escaping arrest by climbing a tree, within earshot of the army. Central to all these memories is the small house passed down through his family, who have been coming to the Wadi to farm their patch of land, grow olives and raise goats for generations. That house is now a shell. The base of a few of the crumbling walls is all that remains after it was destroyed by the Israeli army. On 12 February 2018, the soldiers arrived at around 7.00am. By chance, 58-year-old Rezeq was already there. He saw around 30 border police and soldiers, as well as workers from the Civil Administration and the Nature Reserves and National Parks Unit. Rezeq couldn’t contain his anger. 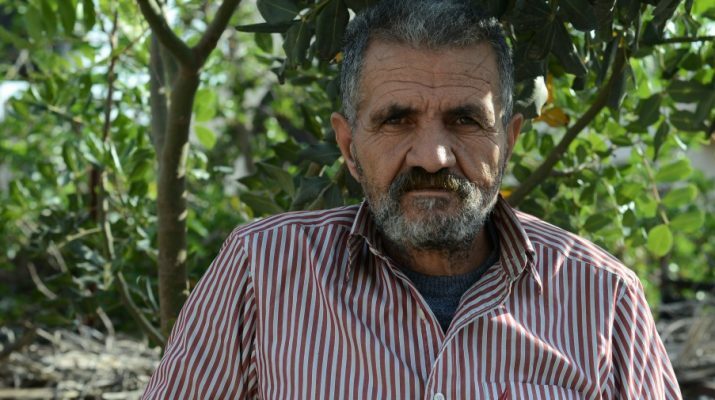 “The soldiers said that I was only claiming to own the land, that I was lying” he explains. “I said ‘Go ahead and shoot me. This is my land, these are my goats.’ I couldn’t stay near the soldiers as I was too angry. “They said to me in Hebrew that I had five minutes. I lit a cigarette, but they said I would be arrested after five minutes and that I should collect my things and that this was not a time for smoking. “I didn’t have time to collect all of my things. I would have needed at least five trips to get our mattresses and everything else. I only collected cigarettes, some lights, chargers, batteries, some dishes. I was confused and just collected what I saw. Rezeq says that the machine used to destroy the house was made by the British company JCB, one of the world’s top three manufacturers of construction equipment. 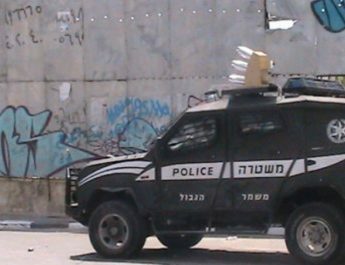 In November 2017, Rezeq’s family had received a demolition order from the Israeli authorities. The reason? They had put a tarpaulin on the roof and some extra stones in a wall to plug the gaps. They had also put some cement on the ground to try and level out the floor. The house is in Area C. Here Israel has full control and it is almost impossible for Palestinians to get permits to do any type of building work, including renovations. 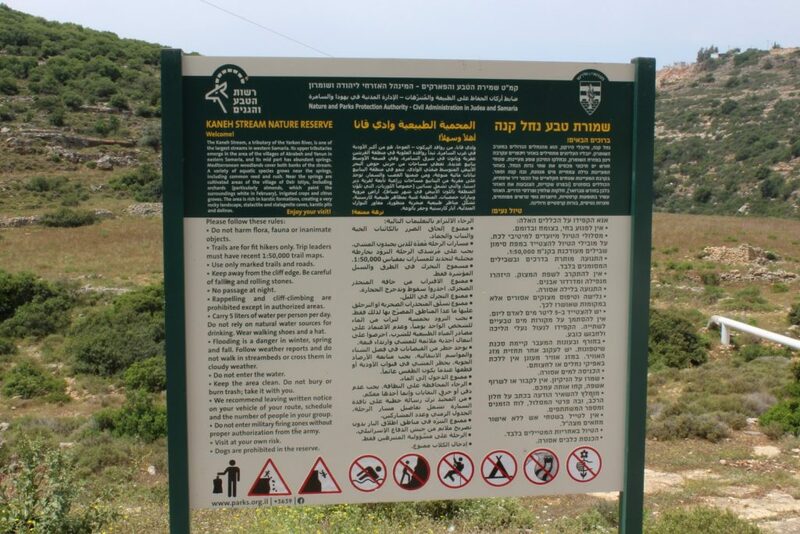 The Wadi was declared a nature reserve in 1983 by the Nature Reserves and National Parks Unit of the Israeli Civil Administration. It had previously been declared a closed military zone in 1978. 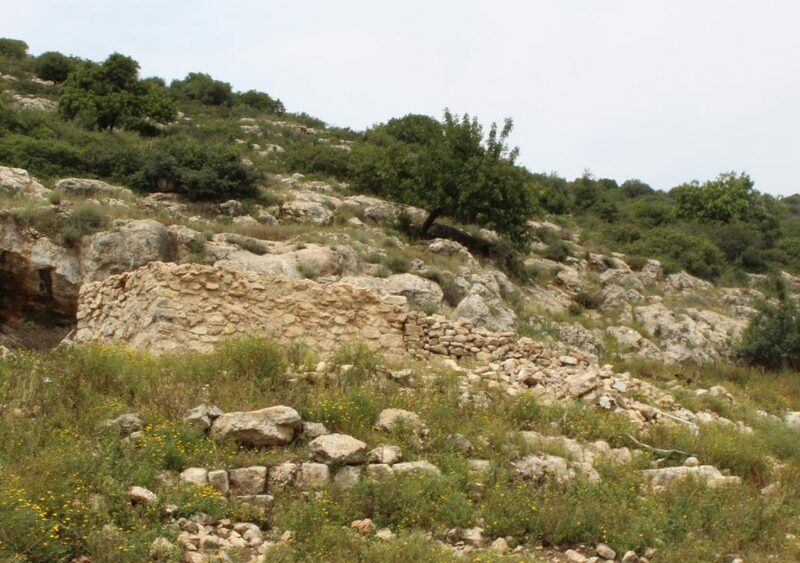 Both are recognisable tactics used by Israel to block Palestinian development in Area C.
Now, Rezeq explains Palestinians in Wadi Qana cannot even plant trees. 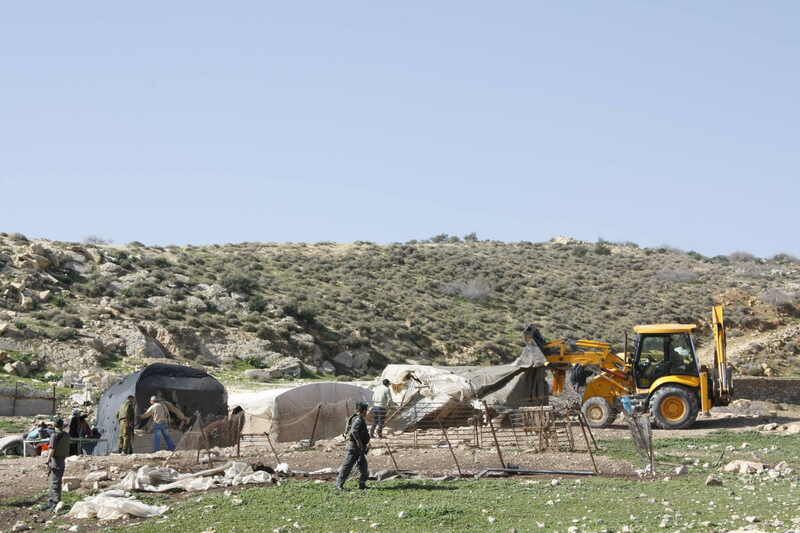 In fact, Rezeq had his trees destroyed by the Israeli authorities several times. Between 2015 and 2017 he says they uprooted more than 3,000 plants and saplings, a lot of them olive trees. “But we can still take care of what we have,” he says, showing us lemon trees that were planted in the 1960s. The area is mostly used for leisure by Palestinians, but Rezeq says they are not allowed on the land after 8.00pm. Wadi Qana is now overshadowed by Israeli settlements, established between 1978 and 1986, on the hills overlooking both banks: Immanuel and Karnei Shomron to the north; Yaqir and Nofim to the south. Later on, settlement outposts were established: Alonei Shilo, El Matan, and Yair Farm. Outposts are colonies which are not authorised by the Israeli government, but often grow into settlements which are sanctioned by the government but illegal under international law. The settlements have brought destruction to both the Palestinian people and the natural environment. “This month the settlers stole five of our goats,” says Rezeq when we meet him in April. 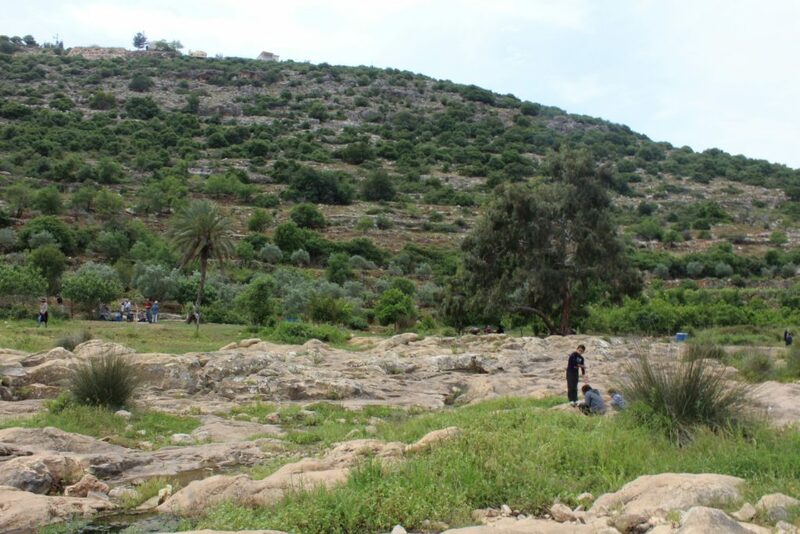 Settlements and outposts have discharged their waste water into the Wadi, polluting the springs and water supply for farmers. This forced the 50 Palestinian families who were living in the Wadi to move to Deir Istiya. According to B’Tselem, the Israeli Information Center for Human Rights in the Occupied Territories, outposts are still releasing waste water directly into the reserve and blockages in the sewage systems of Nofim and Yaqir also occasionally result in pollution of the stream. Rezeq is hopeful that once companies, like JCB, know what their machinery is being used for they may be motivated to do something about it, and prevent the Israeli state from using their equipment to destroy Palestinian houses. For Rezeq, raising awareness of the companies which manufacture machines used in demolitions is part of the wider international Boycott Divestment and Sanctions (BDS) movement. Rezeq says that he thinks BDS will have more success than “other types of activities against the occupation… Some people say that what is taken by force can be gained back by force, but I don’t believe in this way of resisting. I believe that it helps the occupation. Find out more about how to take action against JCB here.